CHARLOTTE, N.C., Feb. 19, 2019 (GLOBE NEWSWIRE) -- Chanticleer Holdings, Inc. (NASDAQ:BURG) (“Chanticleer” or the “Company”), owner, operator, and franchisor of multiple nationally recognized restaurant brands, today congratulated its Little Big Burger Cornelius partner and brand ambassador Denny Hamlin on his Daytona 500 victory. In celebration of Denny’s trip to Victory Lane, all three Little Big Burger locations in Charlotte will be offering free truffle fries with the purchase of a burger. The offer starts today, Tuesday the 19th, and runs through Sunday the 24th. Hamlin is a bona fide NASCAR superstar. The driver of the No. 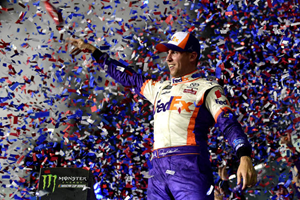 11 Toyota for Joe Gibbs Racing became the first rookie to ever qualify for the NASCAR playoffs and has qualified for the playoffs in 12 of his 13 full seasons racing in NASCAR's elite level. The No. 11 Toyota driver kicked off his 14th full-time season by surviving wild and wreck-filled final laps to win his second Daytona 500 title Sunday. Hamlin came to the Daytona 500 determined to honor his late car owner J.D. Gibbs, Joe Gibbs' eldest son who died last month after battling a degenerative neurological disease with a victory. He delivered with a storybook tribute for Joe Gibbs Racing. The video may be viewed here: Video. Little Big Burger is mentioned at the 2:00 minute mark.